The flowers on the pomegranate tree are blooming and the pomegranate season has begun. Little pomegranates are peeking out from under the leaves already! It’s exciting to think that very soon you’ll be enjoying this delicious tangy fruit in salads, baked goods, savory dishes, juices, and smoothies. Of course, the best way to eat these antioxidant-packed seeds is fresh from the tree. Why eat pomegranates? They can help you fight high cholesterol and high blood pressure and they could very well prevent cancer and other debilitating diseases. But, the most important reason to eat them is that they’re so very tasty! Toss them onto the top of any salad. Juice the seeds into fresh pomegranate juice. Add them to your favorite chicken or pork dish. There’s really no end to the way you can use pomegranate fruit in the kitchen. 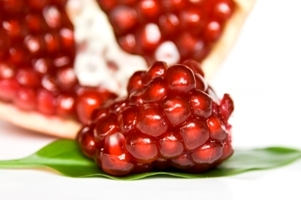 We hope you’re looking forward to pomegranate season as much as we are!